Keyword research process involves finding the right terms used in queries by users on search engines, with the aim of discovering niche keywords that are yet to become competitive and then these keywords are looked into further to find resembling or substitutable keywords. This whole endeavour is powered by keyword research tools, which have the functions of a thesaurus and word suggestion built into them. Keyword research plays an important role while you plan your SEO and content marketing strategy for an organization. It helps to optimize your website/blog, rank faster in search engine results page (SERP) and get more search engine traffic. Be it a larger or smaller chunk of the audience that you target who you want to visit your website, you should plan your keywords accordingly. In fact, keyword research is the basic foundation of SEO. 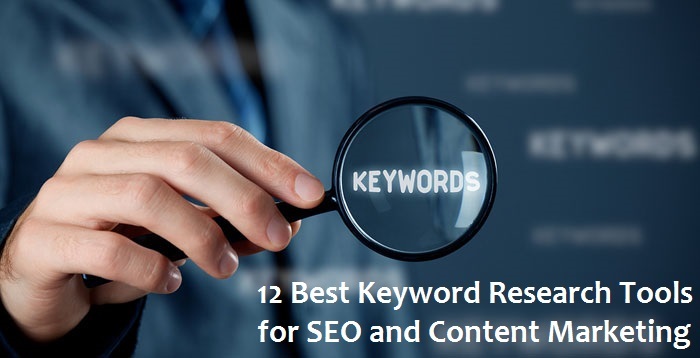 So, here are some of the best keyword research tools that you can use to plan your keyword and rank the content appropriately. If you are new to keyword research process, then Google Keyword Planner is going to be the best place, to begin with. Google Keyword Planner Tools is a widely used keyword research tool. It is absolutely free to use and plan strong keyword lists. The tool comes along with Google Adword product, which is primarily used for PPC advertisement. However, you can use it to research organic keywords by customizing your results for one of your competitors. For using Google Keyword Planner, you need to login to the Google Adwords (if you are not having an account then signup), go to setting option in the right above the corner and select the Keyword planner (click on the link either). With Google Keyword Planner, you can search for new keywords, prepare multiple keyword lists, get search volume and trends and further it can help you to analyze the performance projections for your keyword lists. 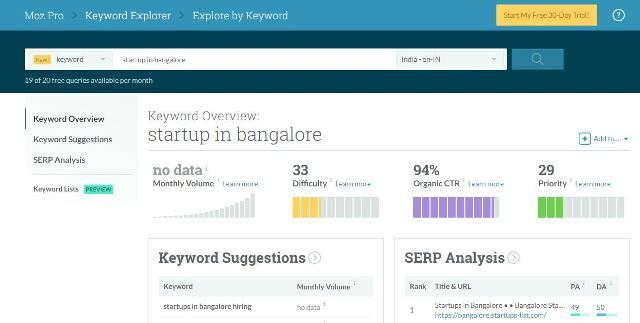 We always recommend using Keyword Planner’s suggestions as a base to build long tail keywords with the help of some of the other tools below. KeywordTool.io is a best keyword research tools. It is simple, exhaustive, and provides great value to keyword researchers in today’s SEO world. The tool uses Google Autocomplete data to create its database of long-tail keyword suggestions. This tool is free for the first 750+ keyword suggestions. 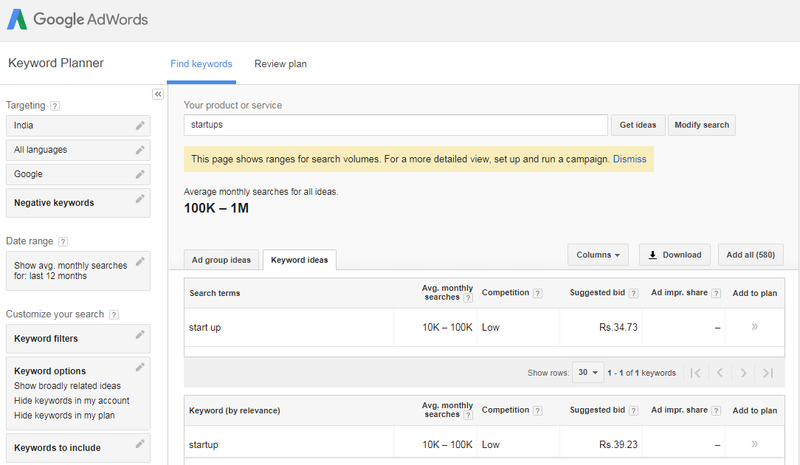 However, you can always sign up for the pro version to see data such as search volume, CPC on AdWords, and competition. The tool also allows you to export your results to CSV. Another interesting feature of Keyword Tool is that it also helps you find long tail keywords for YouTube, Bing, Amazon, and the App Store. SERPs.com is another web-based SEO suite for those who wish to monitor a set of keywords for each site. It’s a paid tool and exclusively designed to track accurate keyword rankings on daily basis. The company was founded in 2012 in Portland, OR. The company today tracks over 2,00,000 keywords for 5000 websites and have customers in 93 countries around the world. With SERPs, you can even create keyword categories, export monthly reports, and export ranked URLs to assess page performance. You can even activate the keyword view for having comprehensive ranking statistics that includes the keywords gaining the top position over a specific period. With these abilities, it seems that customization is the biggest selling point of this tool. SEMrush is a powerful, versatile and remarkably accurate keyword research tools that all the SEO guys use as a complete suite. It is the first finest SEO tool that was ever built to find keywords that your competitors are ranking for. Unlike traditional keyword research, the platform works to identify different trends that happen within your niche, identifying a variety of keywords, audit your on-page SEO, check rankings and backlinks. Believe us or not, but if you are looking for one perfect keyword research tools for long tail Keyword research, look no further than SEMRUSH. The tool comes with a free 14 days trail and it will be enough for you to understand the benefits. Moz is a leader in search and digital marketing tools. It has been used by many SEO professionals on a day to day basis. In 2016, the company has officially launched their keyword research dubbed as “Keyword Explorer” (or KWE). The tool aims to take users through the entire research process while providing metrics and scoring to aid users in their keyword selection. According to Moz, Keyword Explorer was built to cater to power users. It provides accurate monthly search volume data, an idea of how difficult it will be to rank for your keyword, estimated click-through rate, and a score representing your potential to rank. It also suggests related keywords for you to research. Because it cuts out a great deal of manual work and is free to try, we recommend you to explore this keyword research tool and see if it works for your web properties. KWFinder is an excellent long tail keyword research tool that simplifies the keyword research process. The interface shows you trend, search volume, CPC, and difficulty level (from one to a hundred) and the current Google search results. With this tool, you can identify the domains who are targeting the keyword, the page’s backlinks, social shares, and traffic. Further, you can use it to narrow down keywords based on city, state or country. KWFinder comes really handful if you are integrating SEO with content marketing. Soovle is a customizable engine that unites the suggestion services from all the major providers including Google, Bing, Amazon, Answers.com, Yahoo, Wikipedia, Youtube. You get suggestions from up to 15 search engines when you type your keywords into the search box. Soovle is useful for two main purposes. Firstly, it is really helpful if you have a vague idea what you’re looking for but don’t know exactly. Secondly, if you are doing keyword research it is a great source of ideas. You can use this keyword research tool for free. The U.S. based Spyfu is a one-stop internet marketing platform which allows you to spy on your competitor’s keyword research campaign. You can go to SpyFu and type in any website and see every keyword that they’ve ever bought from Google. You can see all their organic keywords and how those have changed over the last 10 years. SpyFu also offers SEO tools and reporting software that compares organic search results to competitors, identifying top performance metrics as well as areas for improvement. In fact, it is a well-designed SEO optimization tool geared toward sales, online marketing, and digital advertising. Ahrefs is the popular toolset for SEO & marketing running on Big Data. It offers most of the SEO aspects such as backlink checking, competitor analysis, keyword research and more. Ahrefs maintains one of the largest indexes of backlinks on the web, currently with more than 12 trillion historical backlinks and 6 billion web pages crawled per day. 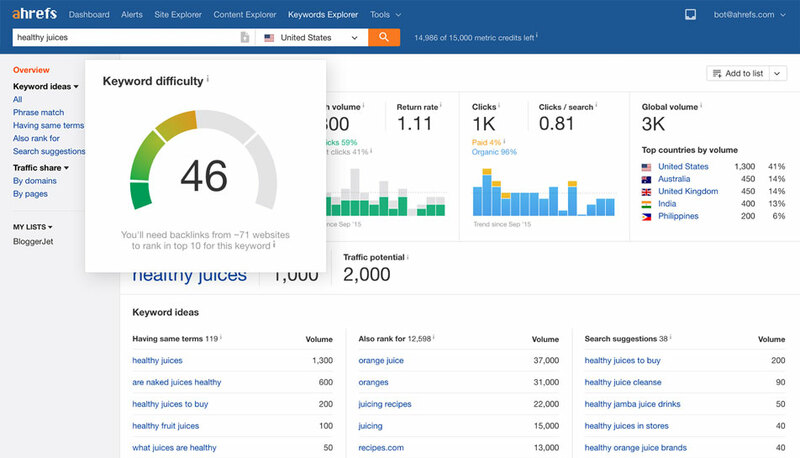 Keywords Explorer is an impressive keyword tool in many ways as it comes with great UI and you can also create a list of keywords to target directly from Ahrefs dashboard. With this tool, you don’t need to use excel & this makes it a huge time saver. Interestingly, this tool also allows you entering up to 10 “seed” keywords into Ahrefs’ Keywords Explorer and you’ll get a huge list of thousands of great keyword ideas. LongTailPro has been the best keyword research tool for a long time. With this keyword research tool, you can find profitable keywords with low competition that will bring more free traffic to your website with less effort. One of its unique characteristics is the possibility of generating hundreds of keywords in just seconds using multiple seed keywords. It can import more than 5 seed keywords simultaneously. LongTail pro used to be a desktop based solution but now it is a cloud-based solution. The tool is popular among niche marketers & a good tool if you are looking for paid options. However, if you want to use it you can get 7-days free trial. 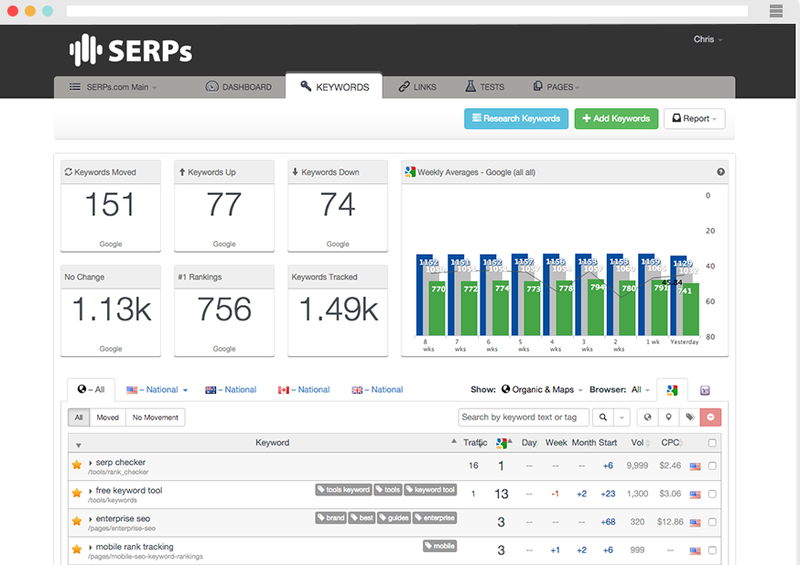 Serpstat is a Growth hacking tool for SEO, PPC, Content Marketing, Marketing, Search Analytics. Serpstat is the first page-oriented platform for a deep competitive analysis that helps to find missing keywords for URL. It tracks the value of your site’s keywords against the top 100 performing domains. Serpstat is the newest competitor research and keyword research tool & a good alternative of SEMrush tool. Wordtracker is a free online keyword research tool that provides you the data to improve your search rankings, attract high levels of targeted traffic to your site. It is used by small businesses to research keywords, build new links, and develop a strategic SEO platform. The massive keyword database contains 3.5 billion searches and is totally independent. It provides you with the right knowledge to optimize your website and marketing campaigns. You can consider further reading how to speed up WordPress website performance easily, and how to limit and disable post revisions in WordPress to maximize the site speed. Do you know any other Keyword Research Tools for SEO and Content Marketing? Let us know from the comment section.